You can't buy style and elegance - you're either born with it or brought up with it. You can however, buy the services of a professional who can make you look stylish and glamorous, but ever seen pictures of the "stylish and elegant" looking sloppy and untidy? Being themselves? You get my drift? Branch and Callaway surmise their way through this book about how the incomparable Jacqueline Kennedy Onassis would handle things in today's world. 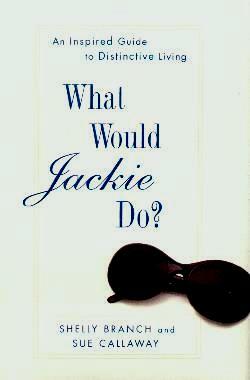 Ms. Jackie's style was so emulated at the time but those days are gone. It's a completely different world now. Besides, as a wealthy woman in the spotlight, her every whim was catered to by talented people, making her look so "cleverly" put together. I don't for one moment doubt her own enviable style. What we should be aiming for is individual style, not worrying too much what others would do or say. Finding a good hairstylist is half the battle. Wearing clothes that suit you, not what's in fashion is another aspect to looking good. On the home front, less is more - a cluttered home is not stylish. Self-control, helping others, kindness, etc., all go into making one a stylish person. This book covers everything from fashion, accessories, gifts, fitness, men, decor, travel, you name it. Sound advice? "Put a brake on the number of times you say "me" and "I"". Too egotistical. (Tough in this me, me, me society.) And sending thank-you notes. A little too pretentious I thought, with all the French words. I say, be your own self. Conclusion - I felt this book is for a select audience, not your average woman. I became bored and uninspired with this book.